Dicamba resistant soybeans in rural McLean County on August 7. When dicamba drifts, it can damage traditional soybeans significantly, with the effects ranging from stunted growth to killing the crops. This year, Illinois had at least 600,000 acres damaged, according to expert estimates. The damage can cost farmers tens of thousands of dollars and is not covered by crop insurance. The use of dicamba, a traditional herbicide used in corn production, increased in Illinois this year after Monsanto and BASF released new versions of the weed killer. Farmers sprayed these on a new genetically modified strain of soybeans made by Monsanto that would not be damaged or killed by dicamba. In August, the Illinois Fertilizer and Chemical Association surveyed its 178 agriculture retail companies about their experience with dicamba this growing season. The association received 124 responses, which were anonymous. The overwhelming majority of respondents reported issues with dicamba, even when following the label. 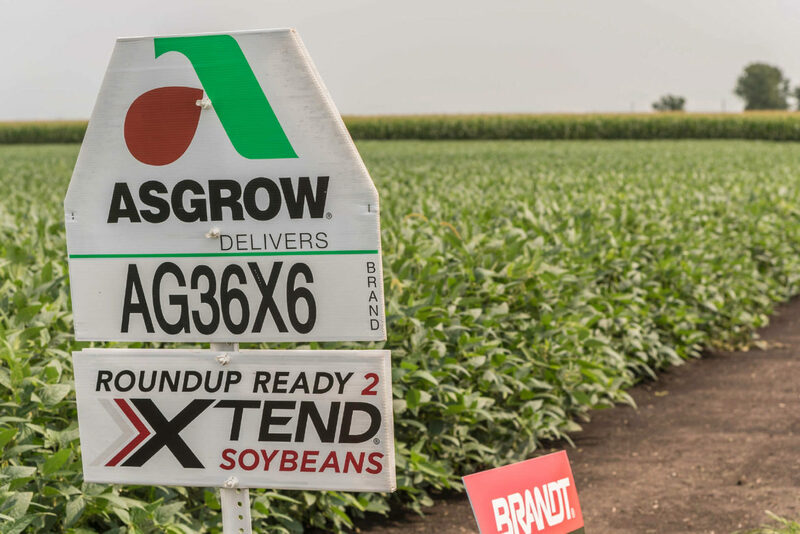 More than half of respondents primarily used BASF’s Engenia herbicide, while more than 40 percent used Monsanto’s Xtendimax. Less than 5 percent used DuPont’s FeXapan. Monsanto did not respond to a request for comment. BASF spokeswoman Odessa Hines said: "It is important for growers to have access to the benefits of Engenia herbicide and we will be as flexible as possible to make that happen." About 85 percent of the companies that apply dicamba said there were significant drift issues, even when the wind was not blowing, according to the survey. Additionally, about 70 percent of agriculture retailers said they had more complaints with dicamba than with all pesticides in a typical season. And while all respondents had some concern about the use of dicamba, more than 60 percent of respondents said they are “extremely concerned” about the potential impact on sensitive crops other than soybeans, such as fruits, vegetables and trees. As a result, many Illinois agriculture retail companies, which include company-owned (Monsanto and BASF) affiliates, independent retailers and cooperatives called for restrictions on dicamba spraying in Illinois. Others said they would not use the product until there were safer procedures. “I’ve never been stressed so much in 15 years as an applicator and it’s going to continue through harvest. I’m ready for another career; however, when I see the weed control it provides I am hopeful we can improve upon the other issues going forward." Since the release of the new version of dicamba, farmers across the Midwest and South have blamed drift from dicamba for ruining millions of acres of soybeans and cotton produced by older versions of seeds. The Illinois Department of Agriculture received more than 240 complaints about dicamba drift. The association has created a guide for farmers and applicators on how to safely use the product next year based on the survey. Association officials met in early October with Monsanto, BASF, farm groups, the Illinois Department of Agriculture and University of Illinois officials to discuss the guide, Executive Director Jean Payne said. “We have a responsibility to improve the situation,” Payne said. The U.S. EPA announced new restrictions to dicamba for the 2018 growing season in October, including the naming of the pesticide as a restricted-use pesticide, which requires increased training for applicators and lowering the wind speeds in which the pesticide can be applied. Payne said the guide, which is not finalized, will provide farmers and applicators with tips that go beyond the label’s instructions to help limit drift. One major change, she said, is that the association will encourage farmers not to plant dicamba-tolerant soybeans next to sensitive soybean fields if they want to the dicamba tolerant fields to be sprayed. The guideline will also encourage farmers to spray their fields earlier in the season. She said applicators may even stop spraying dicamba in June or July. Overall, the association will encourage farmers to plan and coordinate their planting and spraying much earlier than they have in the past, Payne said.